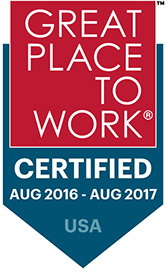 Newark, Calif., September 12, 2016—RoseRyan was recently certified as a great workplace by the independent analysts at Great Place to Work®. Based on extensive ratings in anonymous employee surveys, the national honor distinguishes RoseRyan as a high-trust, high-performing firm. “According to our study, 93 percent of RoseRyan employees say it is a great workplace,” says Sarah Lewis-Kulin, Great Place to Work’s Senior Editor. RoseRyan recognizes extra effort and great work. Read the full results and a recap of RoseRyan’s perks and programs at http://reviews.greatplacetowork.com/roseryan. RoseRyan is an award-winning finance and accounting consulting firm that tackles critical assignments for companies at any stage of their business lifecycle. Nationally recognized in its field, RoseRyan has helped more than 750 clients at all stages since 1993 by delivering specialized finance and accounting firepower exactly when and where it’s needed. From the startup that needs an interim CFO and scalable infrastructure to the publicly traded enterprise challenged with tricky transactions and complex compliance issues, our seasoned pros can help your team or be your team. Whatever the milestone, whatever the challenge, we offer up a savvy blend of public accounting expertise and industry know-how. Based in the San Francisco Bay Area, we focus heavily on the technology and life sciences industries. Recent and current clients include Genomic Health, Nature Box, Tesla Motors, Gilead Sciences, Roku and Philips Lumileds. For more information, visit www.roseryan.com.